These red tulips are blooming in my local park. I saw them when I was walking there with my partner on a lovely sunny afternoon and I took this photo. When I got back I looked up what tulips mean in The Language of Flowers. Apparently, tulips are a symbol of love in much the same way as roses. A gift of red tulips is a declaration of love. Yellow tulips on the other hand mean that your love is without hope. Cunningham's Encyclopedia of Magical Herbs agrees that tulips are flowers of love. They are governed by Venus and are appropriate to put on an altar to the Goddess of Love or when casting love spells. 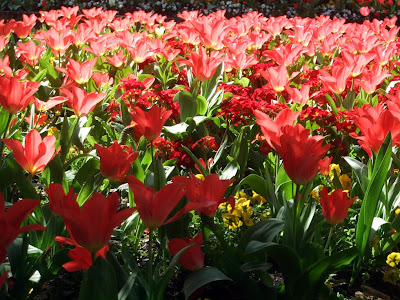 In the Middle East, tulips are thought to offer powers of protection. Huh I never knew that. I have tulips in my front yard so that's good to know. Thanks.